Route 66 Airis Europe Maps (airis-r66n7-eso) €0.00 including FREE DELIVERY - buy online at mysatnav.ie Ireland - FREE SHIPPING. If you already own an Airis T920, Ireland & UK then look no further if you need to get maps of Europe. 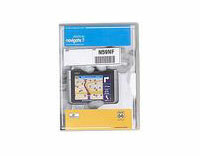 The upgrade includes a 2GB SD card preloaded with the map data and a backup DVD so all you need to do is insert the card in the GPS, activate it and off you go. Note that the map data is Navteq Q4, 2005 so while it is adequate in Europe, the mapping for Ireland is not great.